For Xie Yanyi it was not the physical abuse that was the hardest to endure - although his list of the deliberate cruelties inflicted upon him is long. He was kept in a stress position, crouched on a low stool, from 06:00 in the morning until 22:00 at night. After 15 days like this, he tells me, his legs went numb and he had difficulty urinating. At times he was denied food and was subjected to gruelling interrogations for "dozens of hours" on end. And he was watched while he slept, with his guards insisting that he kept the same sleeping position all night. But harder to bear than all of this, Mr Xie insists, was the time spent in solitary confinement. "I was kept alone in a small room and saw no daylight for half a year. I had nothing to read, nothing to do but to sit on that low stool." "People could go mad in that situation. I was isolated from the world. This is torture - the isolation is more painful than being beaten." Although impossible to verify, his account tallies with other reports of the suffering endured under the so-called "war on law", launched during the Chinese Leader Xi Jinping's first five years in office. Only in Mr Xie's case it is a rare, first-hand account. 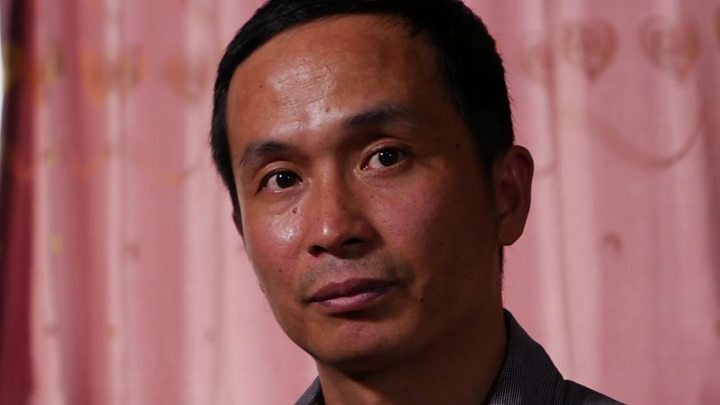 Like the other lawyers involved, Mr Xie was, upon his release, warned not to speak to the foreign media but it is a prohibition he has chosen to ignore. "It might be risky to do this interview," he tells me. "But I feel it's my responsibility to speak out. I have no choice. I can't accept a society that arrests people for what they think and what they say." The crackdown on China's already beleaguered human rights field began in mid 2015, halfway through Xi Jinping's first term. Now, anointed in office for a second term by the Communist Party Congress that ended this week, it stands as one of his most gloomy legacies. In total, more than 300 lawyers, legal assistants and activists have been brought in for questioning, with more than two dozen pursued as formal investigations. Two years on, some have been given long jail terms, others still await sentence and at least one appears to have disappeared completely. Xie Yanyi, like the others targeted by the campaign, has spent much of his legal career representing clients involved in sensitive cases - victims of official corruption, police violence or religious persecution - and harassment and abuse have always been part of the job. He was also a bold advocate for peaceful democratic reform, once having filed a lawsuit against the former Chinese Leader Jiang Zemin for refusing to step down from the Central Military Commission at the end of his presidency. But it is under China's current president that things have taken a dramatic turn for the worse. Shortly after Xi Jinping came to power, at the last Communist Party Congress in 2012, a leaked document began circulating online that outlined seven key ideological concepts that posed a threat to Communist Party rule and forbade the promotion of them in China's universities or in the media. Issued by an office close to the senior Communist Party leadership, the list of forbidden ideologies included "Western constitutional democracy", "universal values" and "civil society". In hindsight, the document now appears to have set the tone for much of what has followed. Mr Xi has presided over a narrowing of the room for public discussion, tighter control over the media, new restrictions on foreign organisations and charities, a clampdown on the internet, and of course, the campaign against the human rights lawyers. For decades, the mantra in the West was that ever increasing trade with China would bring political reform in its wake. "Economic freedom creates the habits of liberty," former US President George W Bush once said in a speech on the subject of engagement with China. And there was a time when that promise appeared to be bearing fruit. Ahead of the 2007 Party Congress, the meeting at which Xi Jinping first emerged as a likely future leader, state media were openly, if tentatively, discussing incremental political change. Even around the 2012 Congress - by which time any glimpses of optimism had already begun fading - open letters and petitions were being published calling for democratic reform in the shape of an independent judiciary and a bill of rights. It would be a brave academic, journalist or lawyer who would put their signature to such a manifesto today. Chinese state run media has dismissed at least one of the accounts of the torture of the human rights lawyers as "fake news" and has accused the foreign media, in its coverage of such cases, as being "great enthusiasts" for negative stories. But even foreign observers can find themselves dazzled by China's skyscrapers, high-speed railways and its rising middle class millions. The plight of a few lawyers and activists can seem to be a diversion from what really matters. But Xie Yanyi's account of torture, and others like it, ought to tell us something very important. As China grows in power, influence and confidence, it is determined to do so without any of the political freedoms that conventional wisdom had once thought of as a prerequisite to becoming a world leading, prosperous economy. The message sent to 1.4 billion citizens has been clear: think very carefully before daring to challenge the authority of the Communist Party, even in the country's own, Communist Party-run courts. Xie Yanyi was released on bail after a total of 18 months in detention. But he is not yet free of surveillance and intimidation. Shortly after we recorded our interview with him in late August, he was visited by the authorities and warned again. This time it was more specific: don't do anything that might upset the preparations for Communism's largest and most sacrosanct political gathering. Out of concern for his safety we agreed to a delay and have waited until after the Party Congress to publish this story. Even the recording itself - as viewers of the video on this page will see - was overshadowed by an ominous presence - a group of around a dozen men who surrounded Mr Xie's apartment. As we watched them out of the window, I asked him if, as a father with three children, it might be better for him to keep a low profile and to stay quiet for a bit? "I am always quiet," came the reply. "My family is kind to everyone. We are always sensible and peaceful." "We are lawful citizens. We are using our lawful rights. We hope all people can live with dignity, respect each other and abide by the rule of law." As the BBC team left, the men surrounded our car, banging on the window and angrily demanding we open the doors. We refused to get out until, eventually, the police arrived. After an hour or so we were told we were free to go. It's a luxury that Xi Jinping's government does not afford to human rights lawyers and their families. Or for that matter, anyone who dares to stand in its way.